Materials: polypropylene reinforced by glass fibres. Colours: white, beige, yellow, red, black, anthracite grey. Dome is a collection of seatings that brings back to mind the glorious tradition of the bistro chairs with curved silhouettes and generous shapes. It recalls the domes of the monuments adorning a lot of cities all around the world. 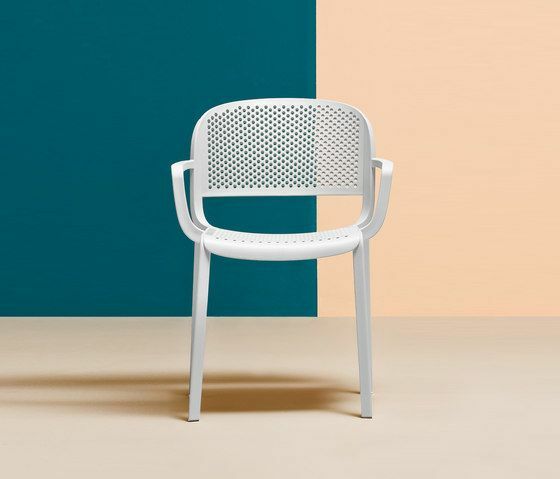 Delicate details of the injected polypropylene remember the joints of the solid wood defining a seating available with or without armrests. The version with perforated shell features a texture recalling the industrial metal plates.